New Japan ran their third show in as many days Sunday, with Night 3 of the 25th Best of the Super Jr. taking place in Shizuoka. The undercard was not made available on New Japan World, but the tournament matches were posted as Video On Demand content late Sunday night Eastern Time. Below are the results from Sunday's card. The two competitors shook hands before locking up. They exchanged holds and shoulder blocks early, keeping everything very basic. Tiger Mask took control with some strikes and worked a headlock and an armlock on the mat, then unleashed some kicks and knee lifts. YOH hit a sweet handspring back elbow, and a dropkick, and Tiger Mask rolled outside. YOH followed him out with a tope, but sold the damage done to his left arm as he waited for Tiger Mask to get back inside. He hit a Falcon Arrow for a nearfall. Tiger Mask came back with a backbreaker, and teased a double underhook superplex, but YOH blocked it. Tiger applied a scissored armbar on the mat, but YOH reached the ropes. YOH hit a superkick and collapsed onto Tiger Mask for a nearfall as both men sold exhaustion. They traded nearfalls with cradles and backslides. Tiger hit a Destroy Suplex for a close nearfall. He landed a high kick, and hit a double underhook superplex for a nearfall, then hit a Tiger Suplex for the pin. This was good. Tiger looked better than he has in his tag outings of late, but I was surprised at how little he gave YOH. Kanemaru jumped Flip at the bell, but Flip, well, flipped his way out of trouble, scored a nearfall off a cradle, and hit a tope con hilo. He went for a springboard strike, but ate a boot to the head, and the action spilled outside. They brawled around ringside and into the seats, with Kanemaru taking firm control of the bout. Back inside, he grounded Flip with a camel clutch. Flip hit a springboard Sling Blade, leading to a double down. The crowd got into the match, firmly behind Flip. Kanemaru went for a suplex, but Flip escaped. They went to the top rope, Flip flew off, and landed a superkick and a dropkick from the mat. Flip went up top, but ate Kanemaru's knees to the gut on the landing. Kanemaru hit a lariat and a slam, but missed a moonsault. Kanemaru hit a Tornado DDT for a nearfall. He came off the top into a superkick, and Flip hit a standing shooting star for a nearfall. Kanemaru used a backslide for a two count. They traded strikes, and went up top. Flip kicked Kanemaru off the top, and hit his Four Flippy Splash for the pin. This was good, but they didn't have the time to make it great. They stalled a lot early on, circling, sizing each other up. BUSHI kicked Taiji outside, but Taiji cut him off before he could hit a tope. BUSHI recovered and went for a guillotine legdrop, but Taiji avoided it and hit a seated senton, then worked a headlock. Taiji sat BUSHI on the middle ropes, and hit a suplex, sliding outside while BUSHI landed in the ring. That was a great spot. BUSHI came back with a DDT, and a flying headscissors. He sent Taiji outside and hit a suicide dive through the ropes. Back inside, BUSHI hit double knees in the corner and a swinging neckbreaker for a nearfall. Taiji hit a handspring into a kick, leading to a double down. BUSHI hit a flying headscissors off the top for a nearfall. He went for an enziguri, but Taiji turned it into a cool move, using a tombstone grip, then dropping into a double knee gutbuster for a nearfall. They traded strikes and BUSHI got a nearfall with a Canadian Destroyer. BUSHI came off the second rope into a Codbreaker, and Taiji followed with the Bloody Cross for the pin. They did some cool stuff, but it seemed like they had some miscommunication in places. They had a hot opening sequence, and within a minute, they established that ACH was a credible threat to Ospreay, as he went flip for flip and reversal for reversal with Ospreay. ACH hit a dropkick and they rolled outside, where Ospreay took over, slamming ACH's left shoulder into the post. 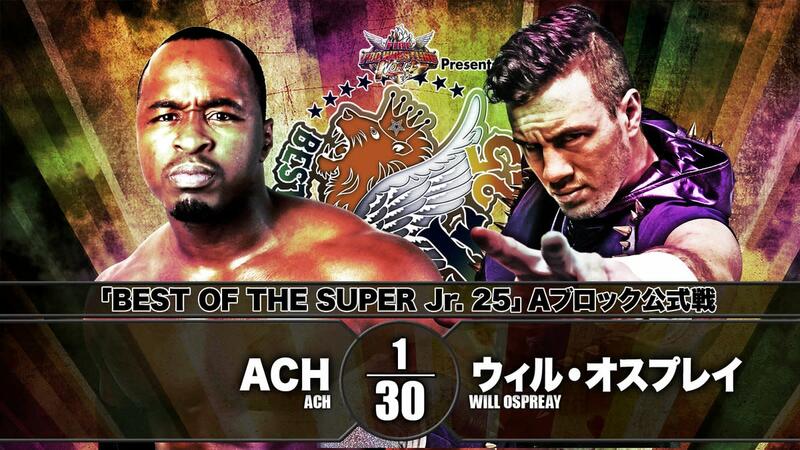 Ospreay targeted the shoulder, and focused much of his offense on holds and strikes. ACH bounced out of an arm wringer into a hip toss attemot, and hit a standing splash, and a foot stomp to Ospreay's back. Ospreay went for a springboard strike, but jumped into a uranage into a bridging suplex for a nearfall. They traded chops and strikes, and Ospreay hit a handspring enziguri, a dropkick into the corner, and a standing shooting star for a nearfall. He followed up with a springboard lariat, and went for the Storm breaker, but ACH reversed into a bridging suplex for a nearfall. Ospreay went for the Oscutter, but ACH turned it into a DVD for a nearfall. ACH missed a charge into the corner, and flipped to the floor. He went for a suplex from the apron, but Ospreay bblocked it, and followed up with a Sasuke Special. Back inside, he hit a corkscrew 450 for a nearfall. He went for another, but ACH knocked him off the top and covered for a nearfall. ACH went for a deadlift german, and finally got it after a struggle. Ospreay turned a suplex attempt into a cutter, leading to a double down. Ospreay went for the Storm Breaker again, but ACH escaped. He ent for a lariat, but Ospreay turned it into a corkscrew kick, and followed with the Storm Breaker for the pin. I personally liked the Dragon Lee match from Night 2 better than this, but this was a fine main event, and one of the two or three best matches of the tournament so far.